Overnight it seems, RNA sequencing technology has been revolutionized yet again. The latest wave of transcriptome analysis that’s sweeping through biology is single-cell RNA sequencing. With the ability to characterize the transcriptomes of individual cells, scientists are revealing unforeseen diversity in cell populations that were thought to be homogenous. 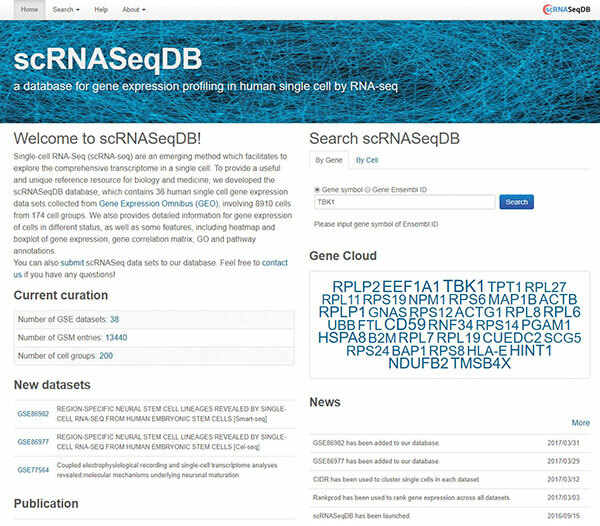 The single-cell RNA Sequencing Database (scRNASeqDB) by the University of Texas Health Science Center provides an excellent online database of human scRNASeq data. Site visitors can search the database by gene or by cell type. The database currently contains 38 datasets that encompass 200 different cell groups. From the website’s homepage, site visitors can quickly view recent news (though the last news update was in 2017), new datasets, and instructions for how they can upload their own datasets to the database.